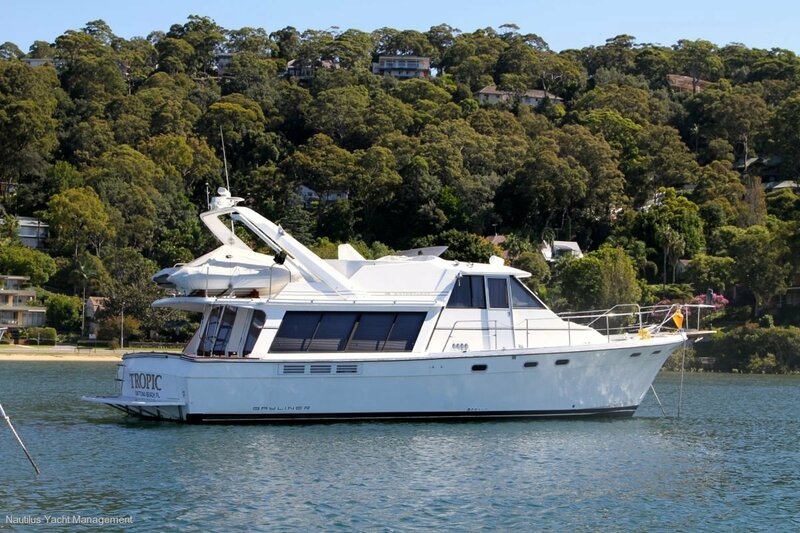 The Bayliner flagship, rarely seen in Australia and presented in immaculate condition after a major overhaul following import to Australia by her owner. Motor yacht Bayliner 4588 'TROPIC' can only be described as Ultimate Indulgence on the Water'! Her shape is sharp, powerful and without the aft bulk of many similar motor yachts, and she can boast of having been chosen to feature in several action movies, included the James Bond movie 'Golden Eye', which if you ask me is quite the cachet! This boat is a veritable ship and a luxurious live-aboard or long range cruising vessel. 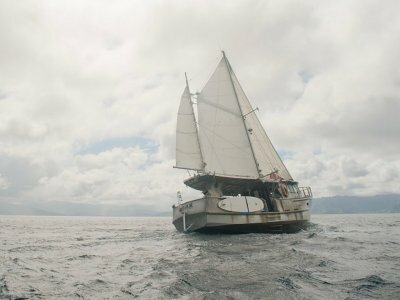 Her owners has had many boat, always getting bigger in size, and 'Tropic' was everything he always wanted. He flew to the US in 2013 to purchase her on the spot and have her shipped back to Australia. Once arrived, he proceeded to have a team of shipwrights, mechanics, electricians, etc. Strip everything and start again. The upholstery was fully replaced with top quality leather, only found in the US and which does not stain, even with red wine. The carpets were also removed and replaced with imported $350/m dove grey Mohawk USA of the best quality, which is also treated to be resistant to even the most aggressive stains and spills. The two US Marine (Hino) turbo charged 240HP engines were given a full service and look over, including new pumps, new hoses, new wiring, new starter motors, new alternators, etc. . Her cruising electronics were fully replaced with top of the range twin Garmin 12' screens. Her external timber trimmings re-varnished (12 coats), interior teak trimmings were re-done, galley appliances were replaced, including new fridge, new stove, new microwave, all new TV (all three) were replaced, light fittings, ice maker, and most of the wiring, batteries, etc. Offering a huge volume of luxury accommodation, with separate pilot-house, which offers the distinction between a boat and a ship (and which is one of the reason the owner chose this model against other boats where the inside helm is in the main cabin), 'Tropic' will provide her new owners with all the possible luxuries of a modern apartment on the water. 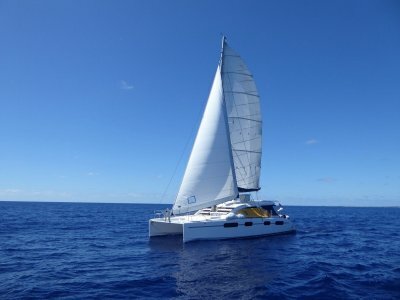 She would make a comfortable live-aboard, offshore fishing boat with her safe aft cockpit and flybridge, (or a high end vessel for fishing charter if you felt inclined to turn the yacht into a business), and will make a few people jealous at your local marina. To begin in the fully re-vamped saloon, which is shaded with tasteful dove grey curtains over venetian blinds (for privacy and sun protection), is a a huge imported white Ultra-leather lounge sitting 8, with opposite settee, side boards and shaded light fittings as well as multiple LED ambiance lights overhead. A carved splashback divides the saloon from the galley, which is on split level, U shape and furnished with all the gourmet appliances you could think of. Large oven, grill, 4 burner stove, microwave, full size fridge/freezer, rubbish compactor, even a receded connecting plug for mixer/ice grinder. Opposite, below the saloon TV is a large ice maker. Going down a few steps is the hallway to the cabins, with two large double guest cabins to port, with across a guest bathroom complete with shower, sink, mirrors, hanging space and ample storage. A cabinet in the hallway hides a front loading washing machine/dryer (new as well), opposite built-in vacuum system. Right forward is the master cabin, with a gigantic island bed, side steps, own TV/DVD player and speakers separate from the rest of the boat, ample light fittings for ambiance and two ensuites. The first ensuite is the master bathroom with wash basin, shower and a full size bath behind a glass screen, second ensuite is opposite guest room. The third bedroom doubles as a study with writing desk and lounge or two single berths. All the timber trimmings and paneling (teak) are oiled, which give a lovely and warm maritime feel to the interior. Going back to the saloon another few steps take you to the bridge, with its two separate external doors leading to the foredeck, including a large companionway to the flybridge. 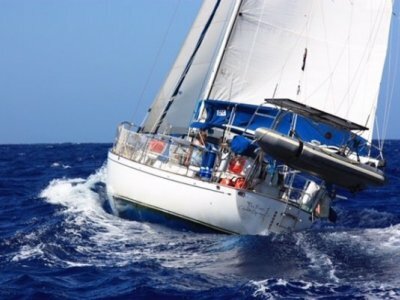 Because it is quite a long way forward (midships) and separate from the rest of the boat, the steerage offers very good visibility and provides the skipper with his own quarters when steering the boat with many guests on board. A small table with settee can accommodate 4 guests in the bridge area, away from traffic and a lovely place to relax and keep the skipper company when under way. Another steerage is accessed through the companionway or via rear cockpit onto the flybridge, with all electronics relayed as well as another remote control for the anchor winch, spotlight, etc. The area is wide, roomy and furnished with built-in sitting for guests. A crane for lifting the tender on and off the boat is also accessed from the flybridge. The radar is mounted well above head height on a GRP arch which complement the modern look of the boat. 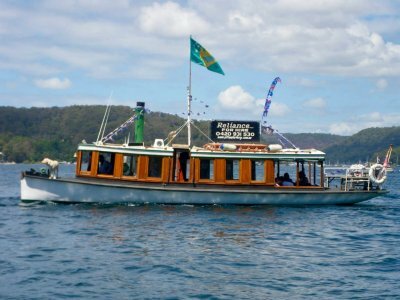 'Tropic' is licensed by RMS for 17 passengers. 2 X US Marine (Hino) Models T250D, Engines were fully rebuilt in 2013/2014. Closed circuit cooling system and ehat exchangers with raw water cooled exhaust. Engines mounted on vibration dampeners mounts/bolts. Counter rotating 4 X blades bronze props on stainless steel shafts. Engine room: Engines acessedd through hydraulic lifting floor. Huge engine room fully lit and offering easy and comfortable access to all engines parts. Westerbeke 12.5 BTDA - 6N60HZ s/n 11118-D102. Diesel generator 12.5Kva 4 cylinders with 348 hours. Large stateroom forward with queen size island bed accessed by side steps, ensuite head/shower/bath, and a large office to port with twin bunks, mahogany writing desk and chair. Guest cabin to port midships with large double bed. Large saloon/dinette with all new uphostery in stain-resistant white leather. French polished mahogany table. Separate settee and brakfast table back of helm station upstairs. Ducted central vacuuming system. 2 X electric marine toilets with holding tanks and macerators. U shape galley with marble tops. Recessed conntection plug for food processor, recessed flush mounted Whirlpool trash compactor under galley counter top. Stove with flush mounted microwave oven above and oven/broiler below. Large capacity front opening stainless steel fridge with seperate feeezer. Double circular stainless steel sinks with hot and cold pressurized water. Frosted and carved glass splashback. Varnished mahogany timber cupboards and drawers in immaculate condition. Muir Cougar / capstan horizontal feed windlass. Up and down from foot switches on bow and from cockpit. 2 X plough anchors mounted on bow plaftorm ready for deployment. One spare fluke type anchor, not rigged, mounted on boa rail. 80m chain and link. 5 X bilge pumps. One Rule Mate 500 GPH, 2 X Rule 1500,1 X Rule 800 and one submersible diaphragm type. Mostly new. 12V and 240V. New Batteries (1 X Duracell and 2 X Energizer ED type with 1400 cold cranking Amps. Fully enclosed in wooden boxes. 4 X battery switches. Switch panel at helm all labelled. Pro Mariner battery charger. Ignition protected. Shore Power. Westerbeke 12.5 BTDA - 6N60HZ s/n 11118-D102. Diesel generator 12.5Kva 4 cylinders with 348 hours. Portawattz 1000DC to AC inverter. Raytheon radar R21X with arch mounted array. Furuno GPS Navogator mpunted at lower helm station. Garmin Chartplotter at upper helm station. Benmar autohelm. Speedlog. Standard Horizon depth sounder. Richie 3 liquid type compass X 2. VHF with 2 X Shakespeare GRP antennas mounted on arch. Tubular stainless steel stanchions, Bow pulpit. Chain type gates for all enclosures. Achor and fender holders on rail, Raised FRP and teak toe-rail and caps, Scuppers, 8 X SS cleats and line chocks, 1 X large deck-box, grabrails, Davits, searchlight. Over $200,000 spent on this yacht since import form Florida in 2013 to turn her into the ultimate dream boat. Owner purchasing a bigger boat and motivated to sell.